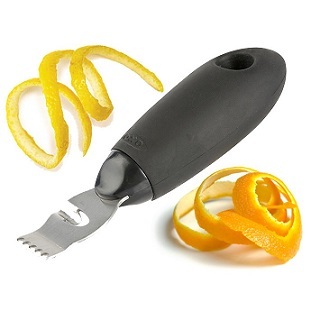 Grate and Zest Your Way to It ! 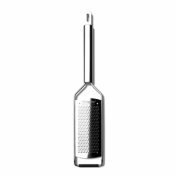 A quality Grater and Zester are cooking tools that will greatly improve the flavors of the food you prepare. Two of the absolute best tools I have purchased in the past few years have to be some Microplane tools. The choices for these tools are indeed numerous but I am going to tell you about the BEST. This page is about the hand-held tools, not rotary or electric units. Hand held units are for home cooking, but important none the less. My favorite tools for doing this work are made by a company called "Microplane." All Microplane cooking tools are engineered based on technology developed by the woodworking industry! This technology was adapted for kitchen use, and it serves those of us who cook very well. Most people understand that grating fresh cheese enhances its flavor value and adds to the entire dish that has been prepared. But when a recipe calls for zesting lemons or limes or ginger or chocolate, many people substitute other products (flavorings?) because they don't want to go to the trouble of doing this task. When that happens, the results are simply not the same. With Microplane tools the task is easy. No need for a great deal of effort or time or ...band aids! These tools really do the work for you and they are safe to use. With the right tool you can have "piles" of quality product effortlessly. Microplane has four basic tools for doing this type of work: a fine screen zester, a standard cut unit, a coarse screen unit and an "extra coarse" kitchen tool. 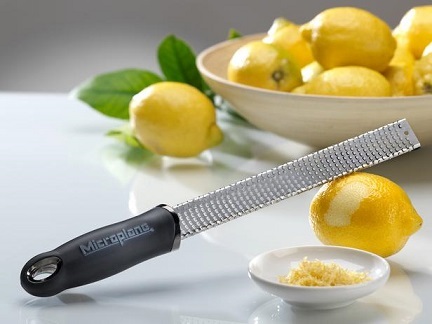 The Microplane Professional Fine Slice Model comes with a blade cover, as do the others in the "Professional" series. This allows the unit to be stored safely. These tools are not very expensive so I encourage you to buy one or two quality ones. You'll be pleased you made that decision. Don’t forget to bookmark this website! I don’t want you to lose it!